life list | Great Auk - or Greatest Auk? I would like to claim that on some level, I knew. That some sixth sense, some migratory instinct, told me to pass by Ames for Missoula and thus preserved me from being underwater at this very juncture. This, however, would be a blatant falsehood. I am here, and not there, because I got in here, and not there. Nevertheless, when we stopped for the night in Ames (at a wonderful bed and breakfast that I heartily recommend to anyone who finds themselves adrift in that section of the country) I did have certain forebodings. For one thing, the weather had, apparently been perfect for growing corn. Anyone familiar with weather knows that this is not a thing that happens without the extensive application of human sacrifice. To give but one example, I lived on the Olde Homestead for eighteen years, and in those eighteen years, there was exactly one summer where the rain and the sun occurred in the right combination at the right time for maize cultivation. So either there was dark witchcraft afoot, or the piper would soon have to be paid. 4. Two bars, both so scary that we felt zero desire to go inside. And this is me and the IT we’re talking about. So, in short, Ames was not the place for me. And yet… as we sat outside the hacienda, a Great Blue Heron flew over the pond. At bit later, a Red-tailed Hawk did the same. Barn Swallows arced over our heads, eating (I hope) the abundant mosquitoes. Song Sparrows set the grass wavering with their weight as they belted out their evening tune, and rabbits browsed on the lawn. A Kingfisher splashed into the water, emerged, and perched on a snag nearby. I watched it for a long time; I rarely see as many Kingfishers as I want. After a time, it was joined by another Kingfisher, a male, presumably its mate. I kept my eyes on the Swallows, finding their flight patterns soothing. Suddenly, something much larger cut across the sky, and I scrambled to switch gears and ID it, fortunately, it circled the house and gave my plenty of time to take in the pointed wings, overall dark color and distinctive white bands across the underwings. I had heard Common Nighthawks before – most recently over Ann Arbor, Michigan, which was far more of what I think of when I think of a college town. But, as careful readers already know, I don’t count ear birds for my life list. So the Common Nighthawk was a gap. Until now. The Nighthawk eventually set a course and disappeared. We also set a course, for a good night’s rest and eventually for Minneapolis and great swaths of new habitat still ahead… still grateful, despite the Nighthawks, that we weren’t staying here and that we had so much yet to explore ahead of us. Word association game for birders: Prairie. At least, that’s what I thought as we drove through Kansas. We had, of course, missed the mating season and thus the fabulous displays that the male birds put on in hopes of winning the opportunity to breed. These dance-offs and Prairie Idol auditions, taking place as they do loudly, persistently, and in a pre-defined location, mark the best chance for long, clear, and impressive looks at a male prairie chicken (whether you are a female prairie chicken looking for a babydaddy or a birder looking for a tick.) But prairie chickens do not dematerialize when they are not dancing, so I hoped that if I put myself in the right habitat, I might get lucky. So, as one does when one is feeling lucky, I turned to Google. Google offered me a few options, but none seemed as appealing as the Shawnee state fishing lake, conveniently located right off the highway that we were traveling on anyhow. I copied down the directions carefully and showed the IT the map. How hard could this be? We set off down the highway, and the first turn appeared soon enough. It couldn’t be fairly called an exit – it was at grade, and we had to cross a lane of traffic heading in the opposite direction to get where we were going. How quaint, I thought. Still, the not-an-exit had appeared just exactly where the map had indicated that it should, and this does not always happen with birding directions that you find on the internet. Or at least, it doesn’t always happen with birding directions that I find on the internet. I examined the roadside wires and posts as we drove, netting quite a few Meadowlarks, some Kingbirds, and an odd-looking Rock Pigeon along the way. Nothing that would constitute a lifer, though, and nothing that screamed Kansas. We made another turn, easy enough to find – but the road down which we’d turned shortly gave way to gravel. “We must be getting close!” I said cheerfully. The Inimitable Todd, no doubt thinking of that day in the future when the car would have to be returned to the rental office, grimaced. We made another turn, and the gravel seemed to get dustier. On the other hand, we also saw a sign for the lake, which I resolutely decided to regard as positive. By the time we reached the lake itself, we were traveling on rutted dirt that our little Chevy Cobalt had never been designed for – the likes of which, in fact, I’d venture to say that most American SUVs never even attain. That speaks more to the inappropriate buying impulses of most Americans than it does to our foolhardiness. I think. There were traces of a campfire where we parked, still fragrant, although only possibly Satan himself could have needed extra warmth in the 90+ degrees of the early afternoon. Far away, a couple of old pickup trucks were parked, but I couldn’t see anyone near them. Kingbirds hawked for dragonflies over an inlet. Far away, I could hear a Song Sparrow and a tractor and the buzzing of various insects. I also heard, after a few minutes of listening, the call of a Northern Bobwhite. This would have been very exciting if I counted ear records for my life list, but I don’t. After all, for all I knew it might have been a Mockingbird mocking a Bobwhite. I neither heard nor saw anything that seemed like it might be a Prairie Chicken. We walked around the lake for a bit, and by a bit I mean all of a few yards. The heat and humidity once again were conspiring to squish the birding impulse clean out of me, and the Inimitable Todd, with less birding impulse to begin with, was past squished. That didn’t mean that he didn’t have his eyes open, though. And it didn’t mean that he’d forgotten what I’d asked him to look out for. So when a sparrow-ish bird popped up that was showing a bit of yellow, he asked me if it was the Dicksissel I’d wanted. “Over there.” He points at a patch of weeds and I scan desperately for a movement. Eventually, he got me on the bird. Sure enough, it was a Dicksissel, my second life bird of the trip. If I reflected on the fact that thus far my life birds had both been very very similar to House Sparrows in their own way, it was only to make a koan on the nature of Nature; and when Todd suggested that we go back to the car and look for the Prairie Chickens with four wheels and some glass between us and the bugs, I did not demur. It seemed to me that it would be a simple matter to go around the lake; unfortunately, the roads did not cooperate. Moreover, dark clouds were gathering. We passed more Meadowlarks, more Kingbirds, many Robins and Mockingbirds. We passed many pastures and fields. The dust followed us like a cloud. Horseflies hit the windows with aplomb. Everything was rattled, even the IT; he eventually pulled out his iPhone and performed his own rite of Google to get us back to the highway. It turned out it was fairly simple – much simpler, for some reason, than getting out there in the first place. I told myself that I hadn’t really expected to see the Prairie Chickens anyway, and this was true; not only was this the wrong time of year, they seemed mythological anyway. Like prairies. Where were the prairies? They were supposed to look different, I was supposed to feel different. But nothing was different. Shortly after we got back onto the highway, the sky opened up with rain that truly earned the name cloudburst in a way that few east coast storms can. “Well, at least you won’t have to pay to wash the car,” I pointed out. The Inimitable Todd grimaced. I glanced out the window just in time to see the distinctive profile of a Scissor-tailed Flycatcher beating a retreat to the relative shelter of a tree. By nightfall, we would be in Iowa. I have to confess, I had forgotten all about the Eurasian Tree Sparrow. I remember reading in the Peterson guide as a child about this smaller, less pushy cousin of the ubiquitous House Sparrow. Unlike the House Sparrow, there was only one successful introduction event for the Eurasian Tree Sparrow (sometimes called the German Sparrow to avoid confusion with the American Tree Sparrow). This event took place in April of 1870, in Lafayette Park in St. Louis. In July of 2010, I checked into a bed and breakfast on Lafayette Square, a little frustrated because I hadn’t yet had a life bird on my epic journey across most of America. Now, I shouldn’t have been surprised, because I was still in mostly-familiar (e.g. Eastern) territory, and birding from a speeding car on the interstate is not really conducive to identifying the finer points of sparrows. (Although if you want to see a bunch of Turkey Vultures it’s a pretty good strategy. And who doesn’t want to see a bunch of Turkey Vultures?) I wasn’t thinking about the Eurasian Tree Sparrow at all, though. I wasn’t even sure if they were still part of the avifauna, or if they’d tapered off into American oblivion; I hadn’t considered the question in years. It was just happenstance, and the fact that my binoculars were around my neck, that the proprietor decided to share a tidbit of local history and mention the introduction of the German Sparrows in the park across the street from his house. Of course, no birder himself, he thought that the House Sparrows in his ivy were the birds in question. Still, the tip was all I needed to jump online and do some quick research (and all praises to the internet for making such things possible!) so that I could target the neighborhoods where Passer domesticus had not pushed out Passer montanus. A helpful site gave me not only the block, but the very backyard to check! Lest you think that modern technology robbed all the challenge from my hunt, though, I would point out that there were a couple of confounding factors. First, we were on a schedule that, while not tight, did involve being in Kansas City before nightfall. Second, it was wiltingly hot and compressingly humid, as one might expect in Missouri in the summer in the middle of the day – and not only does such weather discourage birders, it takes a toll on the birds as well. Red-winged Blackbirds and Starlings around the Arch were panting and flocking to the water features like Saharan castaways. Third, birding in the backyards of strangers is always a hairy proposition – people have been accused of peeping tommery, or worse, for focusing their binoculars indiscriminately. Even as non-threatening a person as yours truly has been ordered off of lawns. And, of course, creeping people out, however inadvertently, doesn’t make one a good ambassador for wildlife. Nevertheless, a life bird is a life bird and it would take a lot more than three confounding factors to make me drive away from St. Louis without putting in a sporting effort to get this one. I think the Inimitable Todd may have been less impressed with some of my birding shenanigans, sometime, but I can’t recall which. He did make a good-faith effort to help me look from the car as we entered Dogtown (“There’s… no, that’s another House Sparrow”) but when it came to actually pounding the pavement, he stayed in the shade-parked car and studied road maps. The birds were not in their appointed backyard. I walked up the block further, staring at Cardinals and Mourning Doves patronizing a well-stocked feeder until a dog began to bark. I circled back, glancing at each passing car with what I hoped was a reassuring, non-felonious face. And then the German Sparrows flew in to the feeder. There were two of them, and as is so often the case with new birds, they were immediately distinct and recognizable in a way that the field guide could not do justice. Their red-brown caps and black ear spots were immediately apparently, but so were their more gracile builds and higher voices. I watched them for only a few minutes. It was, after all, hot, and I was staring into someone’s backyard, and we did have to find the frozen custard stand and the highway and our next rooms down the road. But I will never forget about Eurasian Tree Sparrows again. As Mick Jagger so memorably informs us, you can’t always get what you want. For instance, if it’s your last spring on the East Coast for the foreseeable future, you would want to go out in a blaze of warblery glory. You would wait for the good day that is always just around the corner, hoping for it to fall on a weekend. And then you head out one trip and realize that the good days are all behind you now. 2. We only saw and heard a handful of warblers despite hitting good habitat both at Jamaica Bay and later at Forest Park, among them the damn-near ubiquitous Yellow Warbler, the not-quite-but-nearly-as-ubiquitous American Redstart, and of course the Blackpoll Warbler. Blackpoll Warblers are to predicting the end of migration as color-coded homicidal horsemen are to more traditional forms of eschatology: if you see four or more, it’s not a good sign. 3. The full complement of summertime long-legged waders was present, with the exception of the Tricolor Heron (always a corner case) and, oddly, the Green Heron. In particular, there were notably large numbers of Yellow-crowned Night Herons and a couple of fine-looking Little Blues. There was also a White-faced Ibis, but that doesn’t say anything in particular about the time of year – just that it was a good day for Carrie. 4. Corey spotted a Cardinal feeding fledged young. 5. The Queens Ravens, which gave us fabulous looks. Both parents and young. Because the young looked about ready to jump out of the nest at any second. Yes, if all goes well those little ones too will soon be fledged, marking the completion of the first recorded breeding for the species in the recorded history of the City of New York. A few more migrants may trickle through, and I can still hope to pick up some goodies during the breeding season (Orchard Oriole in Prospect Park, Hooded Warbler at the Olde Homestead, etc.) There may even be an exciting post-breeding wanderer or two waiting to join my New York State list before the end. But the Cape May warbler has earned the right to taunt me from the perch of a nemesis bird. One of the interesting things about nature is that it goes in a circle and in a straight line at the same time. * While the birds of passage are returning to their breeding grounds in the same reassuring rhythm – male Red-winged Blackbirds and then the females, small flocks of Robins today yielding to large flocks of Robins tomorrow, Eastern Phoebes before Olive-sided Flycatchers, Palm Warblers first and Wilson’s after – we large and curious mammals who observe them are going through life changes of a distinctly less reversible nature. Which is to say that there is an excellent chance that come this time next year, I will be embarking on my first spring outside New York State. This means a lot of things, nearly all of them good. But not all – for this may be my last season for some time to partake of the eastern wood-warbler migration. Until now, I’ve participated in the rites of spring in a joyful but rather desultory manner. So what if I dipped on easy birds through procrastination? There’s going to be another season along in a minute. Now I’ve developed a new sense of urgency. Those are the Parulidae known to occur in New York that I have yet to add to my life list. Swainson’s is a bit of a stretch unless I head south, but the others are my mission for this coming season. Let the migration games begin. *if I attribute this to quantum something, I assume I will get a major movie deal, right? Patch birding is wonderful. Patch birding is an unmatched pleasure, an unmitigated good, and in many ways the apotheosis of the birder’s art and science; in its best incarnations, it involves becoming truly one with a piece of the landscape in a way that brings one closer not only to the birds, but to the entire ecosystem. But travel is broadening. And while listing leaves one vulnerable to the pain that desire and attachments bring, it also satisfies the collector’s urge in a way that is relatively harmless and indeed educational. It helps one think globally whilst acting locally. And let’s face it, it’s fun. So the ideal is to travel, and in so doing hook up with someone who knows the local patch. A guide, formal or informal. The Inimitable Todd and I, moved to visit the magical but imperiled Owl Woods of Amherst Island, booked a trip with Lakeshore Nature Tours. Besides multiple species of owls – typical northern highlights like Barred- Saw-whet, Snowy, Long-eared, and Short-eared, as well as the tantalizing prospect of Boreal and Great Gray – the tour offered the possibility of other cold weather specialties such as Northern Shrike, Rough-legged Hawk, Evening Grosbeak, and even Gray Partridge. Sure, it seemed a bit counter-intuitive to run towards the cold and snow rather than away from it, but who ever said that birders make sense? Despite my discontent at the fact that we had to rent a car for the journey, the good times started rolling almost at once. As usual, my first major car trip of the year netted me my first Turkey Vulture of the year. Less expected was a Pileated Woodpecker that flew over the road – beautiful, but too brief to satisfy. And, of course, a plethora of Red-tailed Hawks observed our journey as we made our way down through the Delaware Water Gap, then back up through New York to Ontario. Night fell before we got through the border and to our hotel, scarfed a (sadly overpriced due to the holiday) dinner, and went to bed. The next morning we had a far more leisurely and pleasant breakfast, did introductions with the group, then drove to Kingston and boarded the ferry. It was cold, and not just a little cold – I speak from a place of extensive cold experience when I say that it was really freaking cold. The wind acted on every bit of exposed skin like pincers, and I found myself involuntarily huddling, which was less than effective, as there were no other auks to huddle with. The crossing was nearly frozen over, and the only waterfowl in evidence were a few Canada (and, for once, Canadian) Geese. Amherst Island itself was a charming collection of sheep and horse farms, art studios that had closed for the season, and similar pastoral delights. Most of the roads were gravel-paved and very dusty; the access road to the Owl Woods wasn’t even that ambitious. There were points when I wondered whether my decision to rent a compact car had been a wise one. Nevertheless, we made it to the woods. At the trail-head, cars of all descriptions were nudged up on what passed for the shoulder, and not because the Rapture had occurred. The cautions seemed common-sense, but they turned out to be necessary, because the place was crawling with people. Small kids with parents, college students, and elderly birders alike covered the trails and peered into evergreens. I was hardly in a position to complain that this was a bad thing – going by accent, a lot of them had more right to be there than I did – but the fact remained that this was more agreeable for the ubiquitous Chickadees, who clustered around the feeders looking for handouts of seed, than it was for the owls. 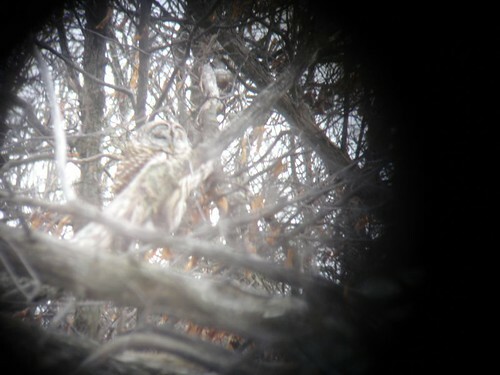 A single Barred Owl was on the hunt, surrounded by numerous spectators and photographers. Though each, individually, seemed respectful, the aggregate effect was a bit overwhelming for me, so I can only imagine how it was for the bird. Nevertheless, it maintained its composure and scanned diligently for voles – and for smaller owls, whose decline the Barred was suspected of having a hand in. Or a talon, as it were. 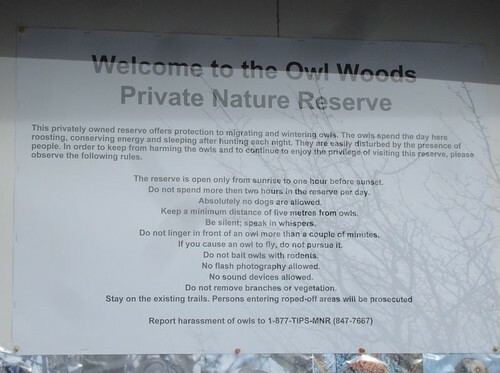 Whether because of the Barred Owl, or the unbarred humans, or both, or neither, we saw no other owls in the Owl Woods. Out on the road again, we circled the island slowly, spotting waterfowl from the banks in the open water of the deeper side. The Gadwall, Buffleheads, and large flocks of Common Goldeneye were all nice, but the Tundra Swans were the stars – lifers for me, and I believe for many others on the tour as well. We also got a short but diagnostic look at a Northern Shrike. Then we scanned the open fields for Snowy Owls (present, but distant) and Short-eared Owls (hiding until the light was too dim to really make them out, alas) as the sun, and the temperature, got lower. Though the day had been long, and many of our target species MIA, I was still reasonably happy as we returned to the inn. Three lifers could not be accounted a bad day, and more promising opportunities were still ahead of us….